Our public school system – from early childhood through the University of North Carolina system – is our greatest resource, and we must make public education a priority again. 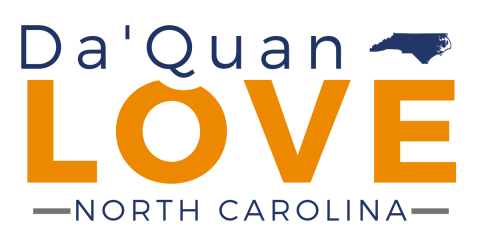 Da’Quan plans to advocate for a strong education policy. When I started teaching in 2014, I couldn't afford to live by myself. I had to live with two other first-year teachers in rural eastern NC. We all had to find side jobs to pay our bills and we struggled just to keep up with food and rent. I’ve seen firsthand how our underfunded education system has affected our teachers, our school staff, and our kids. Every day, they struggle with overcrowding, low pay, and buildings that are falling apart. Our community deserves better than this. For years, North Carolina led the nation in high-quality public education, but funding cuts have caused our students and teachers to suffer. I want to fight for a statewide school construction bond referendum, and explore innovative funding models to help counties pay for upgrades to outdated, inadequate school buildings. We need to restore education funding, and bring teacher pay up to the national average. Finally, we need to support education for all ages. From the four-year-old just learning to read to the 60-year-old taking a community college course for the first time, we need to make sure everyone can access a quality education. I want to put politics aside and do what’s right for NC. I support expanding Medicaid so people who need healthcare can get it. We need common-sense solutions that work for patients, not just wealthy insurance companies. I want to put politics aside and do what’s right for NC. I support expanding Medicaid so people who need healthcare can get it. Republicans have played games with Medicaid by changing how the state pays for it and setting the system up to benefit for-profit health companies. At the end of all this, everyday citizens lose. We’ve got to put our friends and neighbors who need affordable care first. Duplin has consistently been ranked one of the top 5 poorest counties in the state, but hasn’t been given the resources we need. I want to make sure that anyone who needs resources like job skills training and affordable housing can get them. One in every 4 people in our District live in poverty. Duplin has consistently been ranked one of the top 5 poorest counties in the state, but hasn’t been given the resources we need. I want to make sure that anyone who needs resources like job skills training and affordable housing can get them. We have to stop investing state dollars in tax breaks for big corporations in Charlotte and Raleigh - we should be investing in people and local businesses who create well-paying jobs here at home instead. I want to make our state tax system better for hard-working families by restoring the tax credits Republicans eliminated. Let's bring back child-care tax credits, tax breaks for college savings plans, and the Earned Income Tax Credit. We shouldn't reduce taxes for the wealthy while working folks can barely make ends meet. Finally, far too many families lack access to high-speed broadband internet in our district and across the state. We know that at this point, internet access is no longer an amenity - it is a critical tool used to connect schools, businesses and people to the global market. We need to make it available and affordable so our local economy can grow.